ESA's Intermediate Experimental Vehicle was a reentry vehicle designed to study hypersonic aerothermodynamics. Reentry technology experiments satellite built by Thales Alenia Space, Torino for ESA, Europe. Launched 2015. Status: Operational 2015. First Launch: 2015-02-11. Last Launch: 2015-02-11. Number: 1 . Gross mass: 1,844 kg (4,065 lb). Family: Technology. Country: Europe. Launch Vehicles: Vega. Launch Sites: Kourou ZLV. Bibliography: 11251. 2015 February 11 - . 13:40 GMT - . Launch Site: Kourou. Launch Complex: Kourou ZLV. Launch Vehicle: Vega. 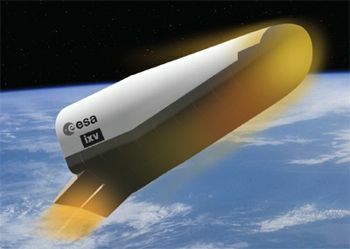 IXV - . Mass: 1,844 kg (4,065 lb). Nation: Europe. Class: Technology. Type: Re-entry test vehicle. 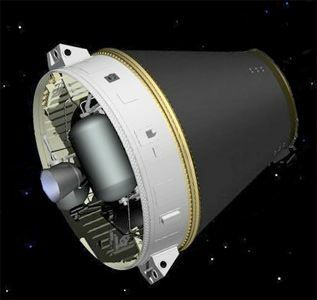 Spacecraft: IXV. COSPAR: 2015-0U01. Apogee: 416 km (258 mi). Perigee: 76 km (47 mi). Inclination: 5.40 deg. Fourth flight of the Vega booster. The AVUM 4th stage entered a 76 km x 416 km x 5.4 deg orbit at 13:53 GMT. ESA's Intermediate Experimental Vehicle was a reentry vehicle designed to study hypersonic aerothermodynamics. The IXV reentered over the Pacific at 14:44 GMT, with parachute deployment at 15:09 GMT and splashdown at 123 deg W / 3 deg N at about 15:18 GMT.